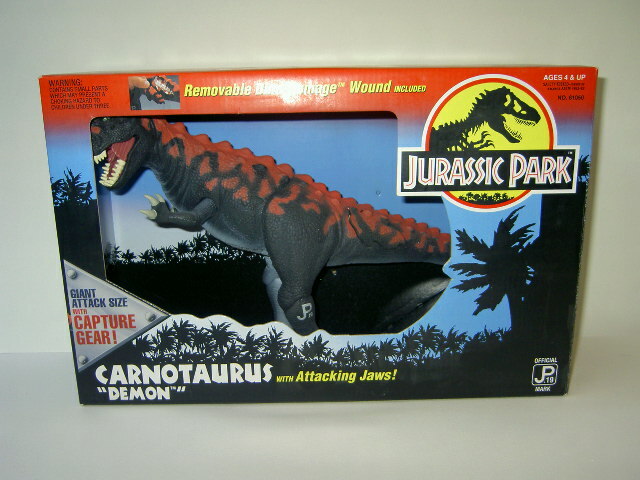 Action feature: "Demon" w/ Attacking Jaws & Removable Dino-Damage Wound. 3pcs of Gear. 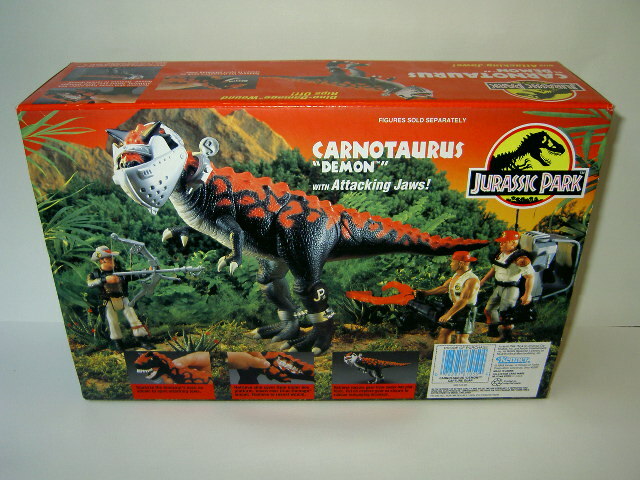 Description: Carnotaurus is one of the bigger dinosaur sculpts of the JPS2 toy line, measuring a good 25 centimetres in length and standing about 15 centimetres tall. It stands in a stalking posture, with its head turned left as if checking out a potential target, and its right leg moved forward, with its arms, particularly its right arm, ready to slash at a nearby victim. Carnotaurus looks very different from other predatory bipedal dinosaurs because of its unusual head, which has very short jaws and sports an overall 'round' quality to it. Above each eye, this creature carries a small triangular horn, which is where it got its name from ('Carnotaurus' meaning 'meat bull', 'meat' referring to its diet, and 'bull' to its horns). The back and head of this beast are covered in rows of lumps, the row in the middle running from its snout to the end of the tail sporting the biggest of these, giving this monster a rather edgy and aggressive look. The teeth work accordingly, and stick out in a rather odd fashion, as if they were deformed. This figure definitely earns its nickname, 'Demon', with a body so bizarre as this! Not only the shape of the body enhances its demonic quality, so does its paint scheme. Most of the body is black, except for the underside (belly and lower part of the tail) which is coloured ghostly beige, while the upper parts of the beast (top of the head, neck, back and upper part of the tail) are red. This red colouring runs over the top black paint in triangular stripes and randomly shaped spots on its back. The big horns on its head are black, while the claws on both hands and feet are grey. The creature has small light green eyes with black pupils and tiny white irises. The inside parts of the mouth are all pink. 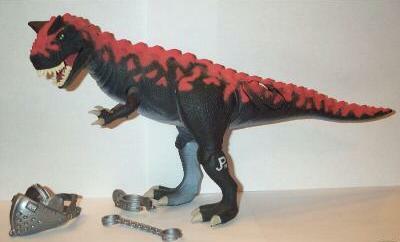 On its left leg the figure sports a white JP logo, with the number .19 next to it. Like most bigger dinosaur figures, especially the ones whose bodies are composed of softer “real feel dinosaur skin” like this Carnotaurus' body is, this figure carries a removable dino damage wound patch. It's located at a rather unusual place, not on the flanks as is most often the case, but on the left side of the base of the tail. It has a very random quality to it and is much less symmetrical than the wound patches of some other dinosaurs (like the JPS1/2 Young T-Rex), revealing white bones and red muscle tissue underneath. This dinosaur also features 'attacking jaws': squeezing the neck makes its jaws open as if the creature is biting. This dinosaur comes with three pieces of capture gear. There is the typical cuff like tag, big enough to at least partially fit around the creature's neck, but thicker than usual (which helps to tell its apart from the tags of the Young T-Rex and Utahraptor figures of this toy line). There is also a leg piece which restrains both legs, but is somewhat too long to really fit between them, forcing the legs apart. Lastly, there's a head piece, much bigger than on the other JPS2 dinosaur figures, which is designed to fit all over the figure's head, almost like a helmet, with only the horns sticking out on top and the area around the nostrils open. This piece is particularly difficult to apply and remove. 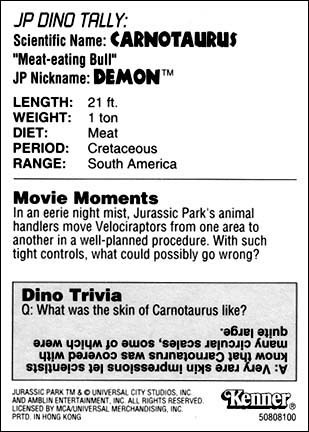 Analysis: Kenner felt daring enough while producing the JPS2 toy line to introduce various rather unknown creatures, including this Carnotaurus (which at the time was at least unknown to the general public, though it's better known nowadays, thanks in part to Disney's Dinosaur which featured Carnotaurus as its main bad guy). With the absence of a huge T-Rex figure, this figure is one of the biggest sculpts of this line (second only to the Utahraptor) and as such got a chance to shine as the new terror on the block, and did a pretty good job despite its rarity and several design flaws. Thanks to its highly unusual appearance Carnotaurus has been a favourite among dinosaur aficionados since its discovery, and this figure definitely did its looks justice, even though it wasn't entirely accurate. It has a very aggressive but appealing look, certainly not a creature you would want to mess with. This feeling is only enhanced by its fiendish paint job, demonic for sure. Yet still something managed to hurt this beastie, looking at its nasty dino damage wound, which looks much more realistic and gritty than that of most other dinosaur figures. The dino damage wound is the most interesting aspect of this figure when judging it from a playability perspective, considering the 'attacking jaws' are pretty lousy by comparison. They work in the same capacity as those of the Young T-Rex figure, in that you have to squeeze the neck to open them, thanks to the soft material the figure's skin is made of. However, they do an even less impressive job than the Rex's jaws did, because these jaws are so stupendously short, so they can only grab smaller prey. They are hardly big or strong enough to lift human figures. An alternative biting mechanism would have been preferable, something the Kenner toy designers probably realized themselves when they designed the TLWS1 Carnotaurus, which had jaws that opened by pulling its leg: even though this system was flawed as well, it was less cheap than this one. This Carnotaurus obviously has better looks than it has action options. The capture gear that comes with this figure strangely enough has the exact opposite problem: it works too well. The head piece almost fully covers the head, and certainly subdues this monster's jaws. However, it's difficult to put it on, and even harder to remove it because it is such a tight fit. When forcing it too much it might cause paint wear on the figure's head, something you shouldn't want to happen because the paint job is one of the best things about this figure. Similarly, the leg piece is too long and forces the legs apart to some extent, which may cause the skin around the legs to crack if you're not careful. Basically, the capture gear is 'too eager' to restrain this figure, so it's better not to use it too much. Playability: limited. The only poseable body parts of this sculpt are the arms. The biting jaws, which are this figure's main attack feature, aren't very impressive because they're so short and can only bite smaller prey. The dino damage wound is of better quality, and looks more realistic and gritty than on most other bigger dinosaur sculpts, while it's still easy to remove and put back. The stance this figure assumes, particularly its head which is turned leftwards, hinders playability to a minor extent. The capture gear adds some more options, though it's only compatible with this figure. However, because they're such a tight fit (especially the head piece), they might cause paint wear when used too often or too carelessly. 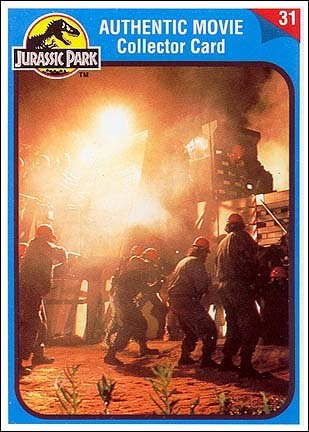 Realism: Carnotaurus was not featured in the first JP movie, nor in its sequels. It did play a part in Michael Crichton's The Lost World novel, as a lethal predator with camouflage abilities. With its noticeable black and red paint job, this figure obviously isn't a camouflaged killer. However, it is instantly recognizable as a Carnotaurus by its bizarre head, with its short jaws and horns above the eyes. It also looks very similar to the Carnotaurus hatchling of the JPS2 toy line, both in shape and colour scheme, adding some consistency to the line. It's not entirely accurate though: the arms are way too long, since Carnotaurus was equipped with the tiniest arms imaginable (no more than stumps really), which also came with four fingers instead of the three this figure sports. Also, its tail is a bit too short. But in comparison to human figures its overall size is about right. Repaint: no, this is a totally new figure. 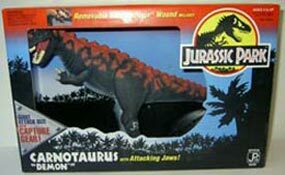 It would not get repainted for later toy lines, even though Kenner added a Carnotaurus figure to its TLW line in 1997 (which was a completely new sculpt). 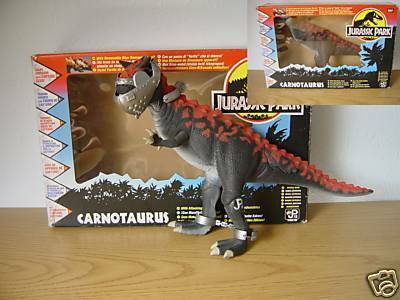 The capture gear also would not be repainted, but the leg piece of this Carnotaurus is identical to that of the JPS2 Utahraptor figure. Overall rating: 7/10. This Carnotaurus looks very cool and is just a plain butch figure with a nasty wound to match, but it has limited playability and comes with a very disappointing biting action. Still, if you can get one you shouldn't hesitate, especially due to the fact that this is quite a rare figure that almost always fetches high prices, even for loose and incomplete figures because it is highly sought after. Whether this is justified is a good question, but apparently most JP collectors think so. But be sure to decide for yourself whether this figure is worth spending loads of money on, because it's very likely you will have to do just that if you want to get one for yourself.